Dr. Matthias Stephan visualizes a future where patients with leukemia could be treated as early as the day they are diagnosed with cellular immunotherapy that is accessible even at their neighborhood clinic and is as simple to administer as present day chemotherapy, but without the severe side effects. This scientific leap could be made possible with nanoparticles, miniature technology that is able to transport tumor-targeting genes directly to immune cells still within the body and program them to destroy cancer cells. In a proof-of-principle research published in Nature Nanotechnology, Stephan and other researchers at Fred Hutchinson Cancer Research Center demonstrated that nanoparticle-programmed immune cells, called T cells, can clear or slow the development of leukemia in a preclinical model. Our technology is the first that we know of to quickly program tumor-recognizing capabilities into T cells without extracting them for laboratory manipulation. Although his technique for programming T cells is still multiple steps away from the clinic, Stephan dreams of a future in which biodegradable nanoparticles could change cell-based immunotherapies - whether for cancer or communicable disease - into an easily administered, off-the-shelf treatment that can be obtained anywhere. Stephan developed his T cell–homing nanoparticles as a way to bring the power of cellular cancer immunotherapy to many people. Cell-based cancer-killing immunotherapies are currently only available via clinical trials, but are showing great potential for patients with certain leukemias whose tumors fight conventional treatment methods. T cells are specialized to already travel through the body, on a hunt for diseased cells, making them a suitable starting point for researchers working to create a living anti-cancer therapy. Scientists have developed strategies to rewire T cells’ genetics so that certain cancer cells show up on their radar as risky. One group of engineered T cells is known as CAR T cells, for the researcher-built chimeric antigen receptors encoded in their new genes. Stephan’s aim is to spare patients receiving CAR T cells via the extended, expensive process that is only available at a few specialized research centers (including Fred Hutch and its clinical care partner, Seattle Cancer Care Alliance). The process requires taking out T cells from patients’ blood, growing, and genetically engineering the cells in a lab, which would take weeks, and then transfusing them back into patients. Additionally, patients must endure chemotherapy procedures that tackle their cancer and also destroy their other immune cells — making space for the new set of CAR T cells they will soon receive. Successful CAR T cells serve as living drugs, able to react to tumor cells, increase their numbers, and survive long enough to potentially build a defense against cancer re-occurrence. But “you already have living drugs inside of your own body, it’s just that you need to retarget them,” noted Stephan. In his technique, the arduous, time-consuming T-cell programming steps all happen within the body, building a potential fleet of “serial killers” within days. In the present study, Stephan and his team designed biodegradable nanoparticles that transport CAR-encoding genes and are tagged with molecules that induce them to stick like burrs to T cells. Once a T cell surrounds the particles, they hitch a ride along the cell’s internal traffic system to the nucleus. In this primary study, Stephan and his team developed the new CAR genes to incorporate into chromosomes found in the nucleus, making it possible for T cells to start decoding the new genes and generating CARs within 24 to 48 hours. When the team established that their CAR-carrying nanoparticles reprogrammed an obvious percent of T cells, they verified their effectiveness. Using a preclinical model of leukemia, Stephan and his colleagues compared their nanoparticle-programming approach against chemotherapy followed by an infusion of T cells programmed in the lab to express CARs, which imitates existing CAR T-cell therapy. The nanoparticle-programed CAR T cells managed well on their own against the infused CAR T cells. Treatment with nanoparticles or infused CAR T cells enhanced survival 58 days on average, up from a median survival of approximately two weeks. The fact that the nanoparticles can yield T cells with a similar cancer-fighting strength as existing approaches gives Stephan hope that he can contribute to a milder, easier, and cheaper way to deliver immunotherapy to patients. In contrast to infused CAR T cells, nanoparticle-programmed T cells do not depend on chemotherapy to clear their way; in fact, the more T cells present for nanoparticle targeting, the better. We’re using the T cells already in the patient. The novelty is that … in theory, this could be frontline therapy [for leukemia] that would not require chemotherapy at all. Since nanoparticles are inexpensive and easy to create, he believes in a therapy that is as easy to store and administer as antibody-based immunotherapies like Keytruda or chemotherapy, but which trains the immune system in the same way as genetically engineered T cells. Stephan’s nanoparticles have a long way to go before they get close to human trials. He is looking for new strategies to develop the gene-delivery and -expression system safe in people and working with companies that have the capacity to manufacture nanoparticles at clinical grade. Additionally, Stephan is now focused on solid tumors and is partnering with several research groups at Fred Hutch. And, he adds, immunotherapy may only be the beginning. 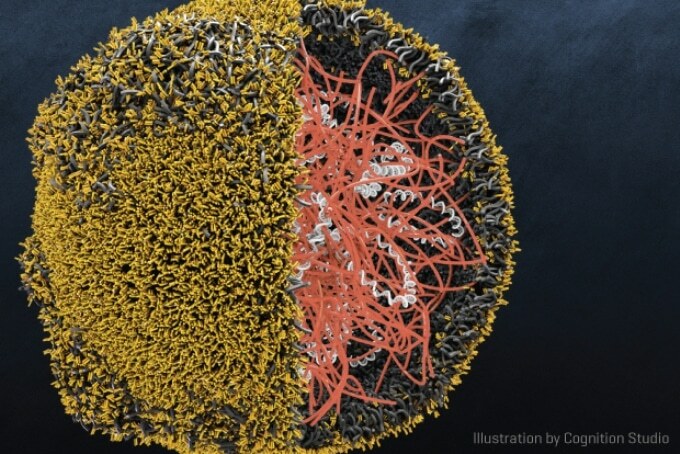 In theory, nanoparticles could be altered to serve the requirements of patients whose immune systems need a boost to protect against a virus, but who cannot wait for several months for a conventional vaccine to start working.